Aromas are pretty complex on this Brazil, bringing sweet praline, brown sugar, caramel and hints of citrus. The body is medium to full and very round and creamy, coating the palate. Soft in acidity, it carries a complex range of fruits from citrus to grape to berry. Sweetness is articulate in the cup, coming with brown sugar, candied pecan and a rich dark chocolate. The deepest tones remind us of fudgey cocoa, cinnamon and carry a smokey nuttiness well into the long finish. We try to keep it simple at Casa Brasil. Our focus is on discovering the incredible coffees of Brazil and bringing them to you at their fullest potential. We buy best-of-harvest beans directly from growers in Brazil and import these coffees to our roasting facility in Austin, Texas where we roast them fresh to order in small batches. We taste every batch of coffee that we roast and are constantly seeking to maximize the flavor in the cup. Thanks for taking the time to learn a little about us. We hope you enjoy our coffees as much as we do. Origins: Brazil. Flavors: Almond, Berry, Brown Sugar, Candied Pecan, Cinnamon, Citrus, Cocoa, Creamy, Dark Chocolate, Fruit Nectar, Fudge, Full Body, Grape, Nutty, Orange, Peanut Butter, and Soft Apple. Brew Descriptors: Chocolatey, Smooth, and Sweet. 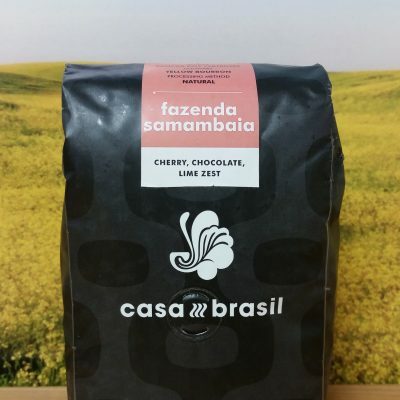 Roasters: Casa Brasil Coffees.